It’s only been out a few parsecs, but someone has already recreated the Star Wars: Rogue One trailer in Fallout 4, using mods and existing assets to get as close to the original as possible. Rogue One isn’t out yet, just like our list of upcoming PC games. 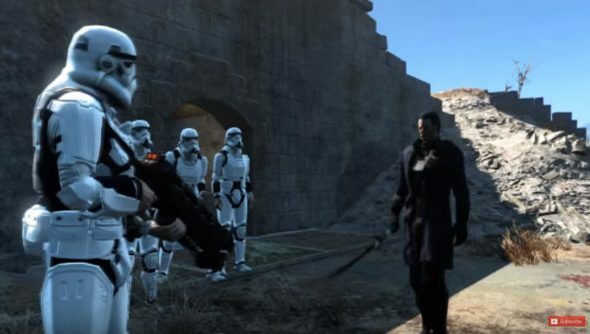 YouTuberUpIsNotJump created the trailer buy using laser rifles and the stormtrooper mod, topping it all off with more than a bit of creative license – Liberty Primes take the place of the AT-ATs, for example. In case you missed the original trailer, you can watch that below, for comparison’s sake. UpIsNotJump’s channel features a bunch of other trailers remade in Fallout 4, including The Walking Dead, Captain America: Civil War, Suicide Squad and Daredevil. Check out the YouTube channel here.